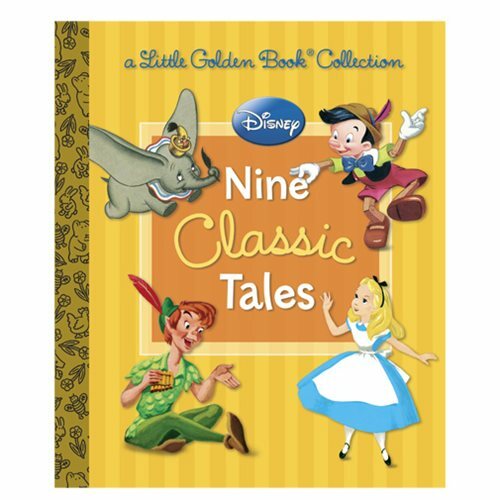 This Disney: Nine Classic Tales Little Golden Book contains stories featuring everyone's favorite Disney characters, including: Dumbo, Pinocchio, The Jungle Book, Lady and the Tramp, Bambi, 101 Dalmatians, Alice in Wonderland, The Lion King, and Peter Pan! This hardcover book with 216 gilded pages and a fancy gold spine will make any kid fill with wonder and joy. It even makes a wonderful gift for any collector of Little Golden Books. Measures approximately 8 1/2-inches X 7.